Planting grass seed is a good way to revitalize a lawn or start a new one. Preparing the soil properly before planting and consistent watering are the keys to success with a new lawn. Choose a grass seed that grows well in your area and plant in the spring or fall; avoid planting during the hottest part of the summer. Avoid using herbicides on the lawn before or immediately after planting. Once the grass is well established, choose a weed-control product that is specific for your grass variety. Till the soil to loosen the top 4 to 6 inches of soil, removing rocks, roots and debris and breaking up hard soil clumps. Get a soil test from your local Extension Service or garden supply to determine the soil pH and fertility. Add soil amendments and fertilizer as recommended by the soil test. Mix any amendments and fertilizer into the soil. Rake the soil to level or create a gradual grade away from the house. Fill in any troughs or ravines. Broadcast the seed by hand or using a mechanical seeder. Rake again to cover the seeds with a thin layer of soil. 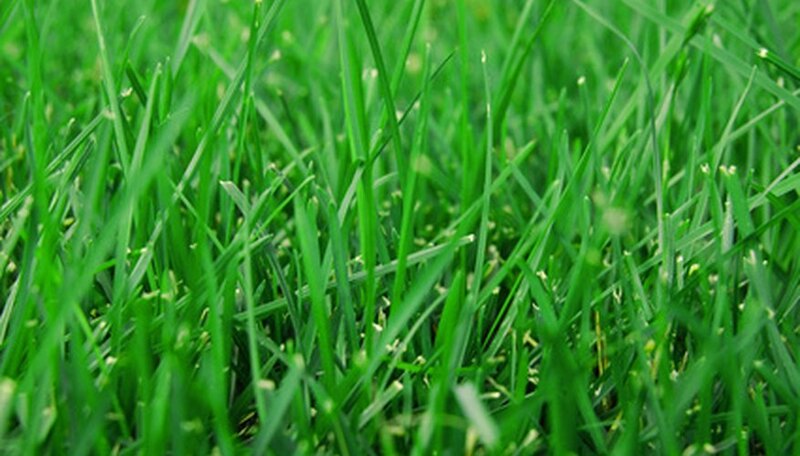 Water the grass seeds lightly once or twice a day until the grass is 2 inches high. Once the roots are established, increase the time between watering and water more deeply, applying 3/4 to 1 inch of water each time.